Peanut Allergy: Do You Need to Avoid Soy and Legumes? If you're allergic to peanuts, which are a legume, you probably don't need to avoid most other legumes such as soybeans, peas, and beans. So generally speaking, you can confidently add soy and other beans to your diet. However, your allergist may advise you differently depending on your individual test results and family medical history. In addition, there's one legume—lupin—that you most likely should avoid, since there's a high likelihood of a reaction to lupin in people who are allergic to peanuts. Many people believe peanuts are a nut—after all, they have the word "nut" in their name. However, that's not correct. Peanuts are in fact a member of a plant family called legumes. The legumes family includes peas and beans, but not tree nuts such as walnuts and pecans. Often, people who are allergic to one food are allergic to closely related foods due to some of the same allergenic proteins being in both foods. This phenomenon is known as cross-reactivity. One common example is that people who are allergic to shrimp often are allergic to other shellfish, such as crabs and lobster. In the case of peanuts, though, there does not appear to be a high level of cross-reactivity between peanuts and other legumes like beans, peas, and soybeans. Although peanuts are a member of the legume family, your risk of being allergic to other legumes, such as soybeans, does not rise simply because you are allergic to peanuts. Curiously, people with peanut allergies are at greater-than-normal risk of tree nut allergy, even though peanuts are more closely related botanically to legumes such as soybeans than they are to tree nuts. For this reason, many people with peanut allergies are advised to avoid tree nuts as a precaution. Can Soy Sensitize Babies to Peanuts? 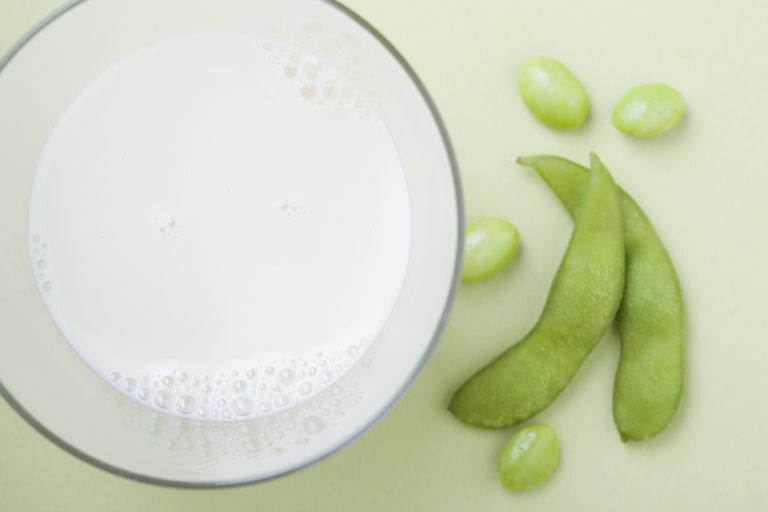 It's not clear whether drinking formula made from soy milk might contribute to peanut allergy. Studies have shown contradictory results as to whether early introduction of soy milk or soy formula can sensitize children to peanuts and make them more likely to develop a peanut allergy. Some studies have indeed shown that infants fed soy formula are more likely to develop peanut allergies. In a study involving 13,971 children, a total of 49 children had a history of peanut allergy, and doctors confirmed peanut allergy through a peanut challenge in 23 of the 36 children tested. But another study published in the Journal of Clinical Allergy and Immunology suggested that the milk allergies that prompted parents to switch to soy-based formulas may have themselves caused the increased number of peanut allergies in soy-fed babies in previous studies. Once the researchers adjusted for these factors, the association between soy formula and peanut allergy disappeared. One type of legume, lupin, may pose higher risks than other legumes for those who have peanut allergy. Lupin (also known as lupine) is a legume that's common in Europe, where it's used as flour in baked goods. It's becoming more common in the U.S., where lupin flour is used occasionally in gluten-free baked goods. Studies have shown that up to half of people with peanut allergies experience an allergic reaction when they consume lupin. Therefore, you should talk to your doctor before trying lupin, and watch for it on food labels. For the time being, the research question on whether babies and children at risk for peanut allergy should consume soy is not completely resolved, and parents should follow their pediatricians' recommendations on feeding their infants. In general, the American Academy of Pediatrics recommends that​ babies at high risk for developing food allergies be exclusively breast-fed for at least four months and up to six months. If that's not possible, pediatricians recommend using hypoallergenic infant formula, not soy formulas, for babies at risk for or with a history of food allergies. Fleischer DM et al. Primary Prevention of Allergic Disease through Nutritional Interventions. The Journal of Allergy and Clinical Immunology in Practice. 2013 Jan;1(1):29-36. Koplin, Jennifer, et al. "Soy Consumption is Not a Risk Factor for Peanut Sensitization." Journal of Allergy and Clinical Immunology. June 2008 121(6): 1455-59. Lack G et al. Factors associated with the development of peanut allergy in childhood. New England Journal of Medicine. 2003 Mar 13;348(11):977-85. Sicherer, Scott H. and Hugh A. Sampson. "Peanut Allergy: Emerging Concepts and Approaches for an Apparent Epidemic." Journal of Allergy and Clinical Immunology. Sept. 2007 120(3): 491-503.